Peculiar twinfolk roam across a brand new world - lumbering spheres that resemble two humans bound back-to-back. Their hearts beat to the same song as they finish painting the trees and sculpting the stones. They know nothing yet of anger, nor hurt, nor love. But as the mountains grow slowly around them, so too do the cracks in the human condition - until maddened by selfish desire they tear themselves in two and cast a fiery rift between them. As the the ash settles, their lives find a new normal, but loneliness hangs in the air…. along with an unfamiliar feeling deep in their souls. They long to find their lost half, but to do so means bridging the deepest rift of all. 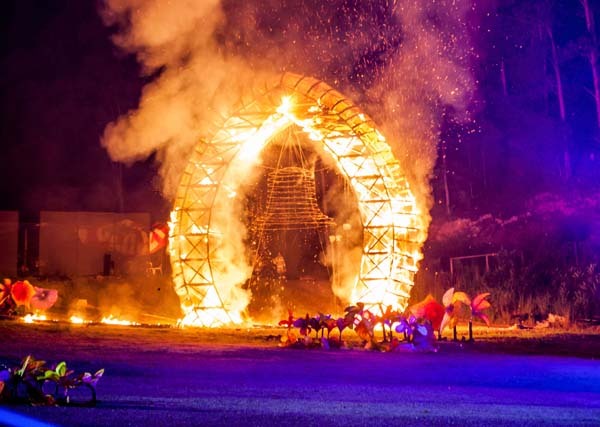 The Fire Event is created by a dedicated team of over 160 volunteer artists, makers, puppeteers, performers, painters and pyrotechnicians.